Seoulsome: Halloween 2011 Nights Out Around Seoul, Korea. - Hundreds of foreigners will be taking to the sea on a party boat off the coast of Incheon on Saturday 29th October. The official Facebook page has all the event information. Tickets are 50,000 won and include a coach transfer to the boat but no alcohol. Halloween Cruise and Club Party. 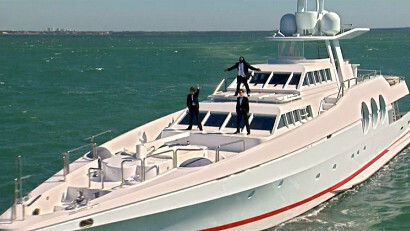 - If you don't fancy the open seas then you can still enjoy all the fun of a party boat. There will be Halloween Party Cruises happening on the same night on the Han River. There's a few different options from 28,000 - 35,000 won. Check out the Han River Halloween Party Cruise page on Facebook. - If you prefer dry land then you could head to B One lounge Club in Itaewon. They are holding a Halloween costume party. 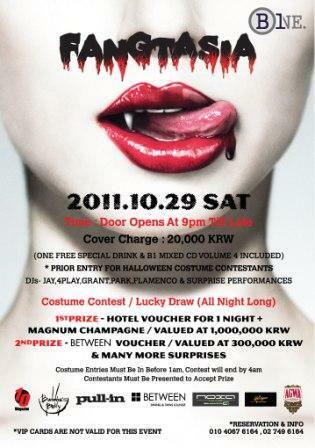 Entrance is 20,000 won including a cocktail and a Halloween CD. There are amazing prizes for the best costumes. 1st Prize is a one night hotel stay and a magnum of Champagne (worth 1,000,000 won) and second prize is a 300,000 won voucher for Between Bar in Itaewon. Check out B One Lounge Club's Facebook page for all the information. There will be a lot more going on I'm sure so if I hear of anything noteworthy I will update this post. If you personally know of anything else fun that's happening in Seoul please let me know so that I can post it for everyone to read about. 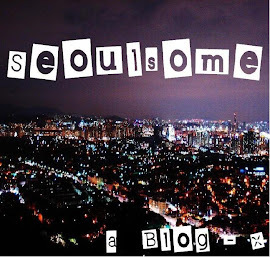 Lastly remember to follow Seoulsome here and on Facebook.